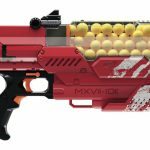 The Nemesis MXVII-10K is a fully automatic blaster. It features two tactical rails: a long rail on top of the blaster and a smaller one below the muzzle. On either end of the top rail are integrated, flip-up sights.